In the treatment planning stages of more complex procedures, your dentist needs additional information about your oral anatomy that simply cannot be provided by a traditional two-dimensional X-ray. The Cone Beam scanner is the perfect tool for capturing an in-depth digital image that Dr. Lieberman and Dr. Page can use when preparing for dental implant placement. Below, find out more information about this tool -- including how it works, what we use it for, and what you can expect if you need to have this type of scan. “I do not like going to the dentist, and Drs. Lieberman and Page know this. In the three-plus years I have been their patient, they have always made me feel welcome, and more importantly, comfortable with my dental work. They have always exhibited the highest levels of professionalism, as have all of the staff. I highly recommend them to anyone looking for a dental practice they can trust to do what is right." What Is the Cone Beam Scanner? Similar to a traditional CT scan, the Cone Beam scanner captures a three-dimensional image that Dr. Page and Dr. Lieberman use to plan restorative dentistry procedures. The beam is a slightly different shape than that used in a traditional CT scan, and it also exposes the patient to less radiation in the process. Furthermore, the Cone Beam scanner is small enough to be housed within the dental practice -- so we can further centralize each step of the treatment process in one convenient location. The Cone Beam scanner is especially useful in the treatment planning phase of dental implant procedures. We need to have a comprehensive image of the teeth, bones, nerves, and blood vessels in order to place dental implants safely and accurately. The digital, three-dimensional scan and the fabrication of surgical guides make it possible to do that. The dental implant process at Capital Smiles is all completed in our convenient office and includes planning, placement, recovery, and finally the restoration of the implant posts. By using advanced technology including the Cone Beam scanner as well as sedation dentistry, which keeps you relaxed throughout the procedures, you can rest assured that your experience at Capital Smiles will be completely comfortable. You do not have to do anything special in order to get a Cone Beam scan taken. It helps to wear loose clothing and, because you will have to remove any large jewelry anyway, to come without too many accessories. It only takes a few minutes to have the scan completed. We will have you stand comfortably and still under the scanner. After precisely positioning your head and jaw for optimal image capture, we will activate the machine. The image is captured in a matter of seconds. Then, it is ready for viewing on our computer screen -- and the important treatment planning phase can begin. 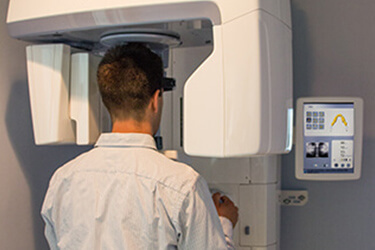 The Cone Beam scan is an invaluable tool for any state-of-the-art dental practice. Given the fact that it is quick, painless, and does not require anything special on your end, there is nothing to fear from a Cone Beam scan! To learn more about how Capital Smiles uses advanced technology to enhance our dental services or to schedule a consultation to discuss any of our general, restorative, or cosmetic dentistry treatments, you are invited to contact us today.